Links at the end provide more explanation of GWO’s unique model based upon ocean water pulses linked to solar/lunar activities, nothing to do with CO2. Text below from 712News with my bolds. GWO also predicted the United States would have 6 named storms and 3 hurricanes making landfall in 2017 – and where they would occur. Just as predicted, the U.S. ended up with six named storms and 3 hurricanes. 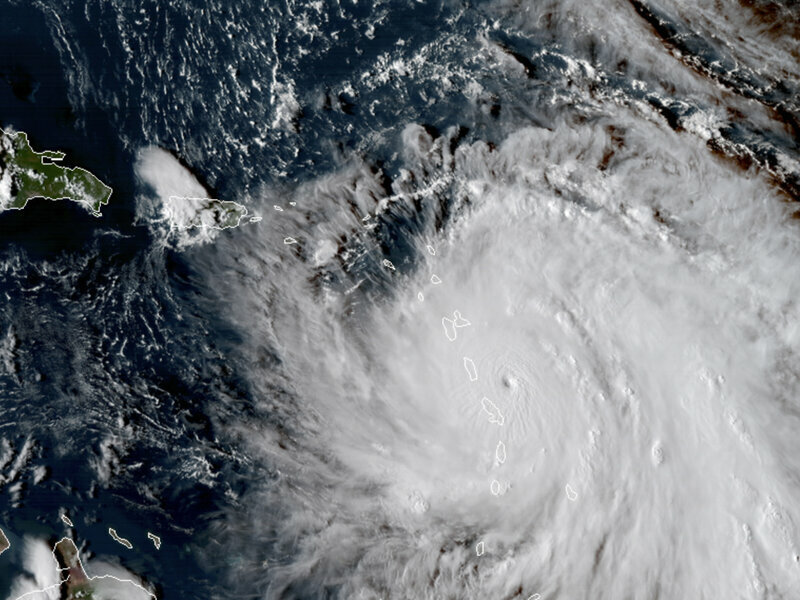 GWO predicted that the Florida Peninsula would break out of their 12-year hurricane drought with a major category 3-4 hurricane making landfall on the south tip of Florida. GWO also predicted that Texas could break out of their 8-year hurricane drought with a landfalling hurricane just above Corpus Christi – and a Category 1 hurricane striking the upper Gulf Coast. The 2017 landfalling hurricanes ended up being – Harvey, Irma and Nate. If he gets it right he is god. If he gets it right it is sheer luck. Global Temperature anomalies should cool for another 6 months. No one knows If an El Nino develops at the end of the year. So if there is a La Nina but lots of Hurricanes is he right because he is wrong?? 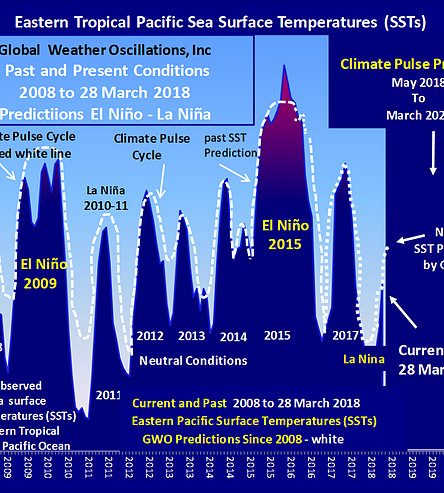 Did we not have some La Nina conditions last year? Hurricanes capriciously develop and cross coasts. There is a 30 year average recurrence rate. Hence where ever and whenever he predicts a hurricane to hit he has only a 3.33 chance, per hurricane of being correct and that is only on place. Much less chance if nominating the time as well. It is no good saying I said New Orleans will be hit in June and it hits in July . That is like 100% wrong. Keep his prediction up and redo this post in 8 months Ron. The Atlantic Hurricane season runs from June 1 through the end of November. One remembers that at 2/3 rds of the way through this was on track to be the busiest season ever, until it ran out of puff. Did he really predict all this anomalous behaviour beforehand? I did not see this claim made at the time. David Dilley never claimed to be God, so your assertion is absurd. Furthermore, his predictive model tends to be more accurate than most. Look out now, here comes hurricane Florence and two more right behind her. And on a closing note, Dilley predicts the mini-ice age to being in the mid 2020s, with very cold winters with increasing instensity, leading to massive crop failures and relocations of people. You would do well to heed this information, because time is very short. angech, it’s a prediction of an active Atlantic storm season, which others share. La Nina conditions favor Atlantic storms due to reduced wind shear. Last year a weak El Nino did not prevent those hurricanes, and likely will not this year either. As we know, several factors produce storms and no one knows the future, except the certainty that any storm will be blamed on fossil fuels. As we know, several factors produce storms and no one knows the future, except the certainty that any storm will be blamed on fossil fuels. Will be interesting to see this play out. I live in fear of a bad season being used for those purposes. Would love to see some of those prediction sites and dates listed and see if they do occur. Not that we will not have hurricanes. Just that 100’s of people predict so one will be right somewhere. This was not just a prediction of an active hurricane season, I can do that and be wrong half the time. It was a prediction of dates and places. So worth putting up to show up. Not worth putting up the hundreds as one will always be right somewhere. All Weather Stations make predictions. Predictions are as the name suggests – indicating that a certain number of storms and hurricanes are likely to occur; it MAY or MAY NOT turn out that way. GWO appears to be the most accurate in predicting hurricane season outlooks in recent years due to their climate pulse method. Well done. It is not expected of any weather station to have 100% accuracy in predicting. We can appreciate all weather stations and their efforts to predict each season. Thanks for commenting Simon. As you say, GWO may have it wrong this year, what with some cooling in North Atlantic reducing the energy available. OTOH, the pipeline of tropical depressions is starting to form in the eastern Atlantic. Hold onto your hat.